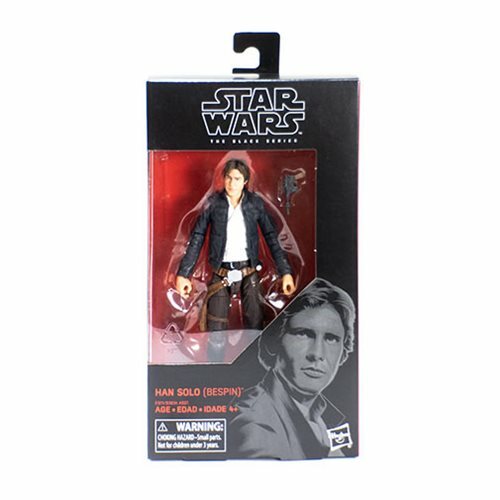 Awesome 6-inch The Black Series Han Solo action figure from The Empire Strikes Back! It's your chance to get Harrison Ford as an exquisitely detailed 6-inch tall action figure! Original Trilogy-era figure comes with blaster. Add a scoundrel to your collection! Bring the very best of Star Wars home with the Star Wars The Black Series Han Solo (Bespin) 6-Inch Action Figure. This out-of-this-world 6-inch scale action figure was developed in conjunction with Lucasfilm, Hasbro, and Gentle Giant to bring you the highest level of detail and authenticity with a stunning likeness of Harrison Ford. Collect them all, and start your collection right here! Ages 8 and up.